The North Penn Volunteer Fire Company, North Wales, Pennsylvania, wanted to replace a 1997 Simon LTI 75-foot quint with a longer ladder, but not necessarily another quint, as long as the rig had a pump and water tank as well as an expanded complement of ground ladders. North Penn got what they wanted from KME. Taylor says North Penn’s truck committee put together its specs and sent them out to multiple apparatus manufacturers and eventually started to work with KME because, “We had good luck with them from an engine that we had purchased in 2014. 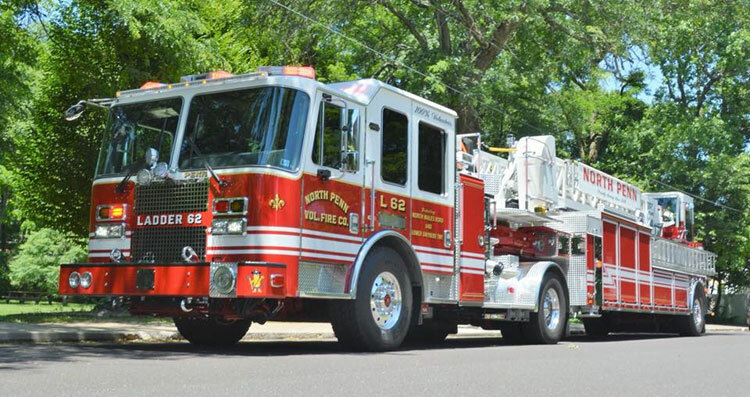 Our special requirements were that we wanted as many ground ladders as possible, so we didn’t spec a maximum length, and wanted the same cab as our KME engine, a Severe Service se with a 10-inch raised roof t up for six firefighters,” Taylor says. The tractor-drawn aerial (TDA) that KME built for North Penn is an AerialCat™ 101-foot ladder on a 100-inch wide Severe Service XMFD cab with a 10-inch raised roof and a heated and cooled tiller cab. It’s powered by a 500-hp Cummins ISN12 engine with a Jake brake, an Allison 4000 EVS six-speed automatic transmission, and a Telma driveline retarder. The rig’s body is 3/16-inch aluminum with painted-finish Amdor roll-up doors. Pete Hoherchak, aerial product manager for KME, says North Penn’s TDA, or “quiller” as he terms it, has a Waterous CX 1,500-gpm single-stage pump and a 300-gallon polypropylene water tank but no provision to carry supply line. “The aerial has a 2.5:1 structural safety factor, a 94-foot horizontal reach, -7 to +80-degree elevation, a 500-pound unrestricted wet/dry tip load rating, a 14-foot outrigger stabilizer stance that can be short jacked, a waterway with store-front blitz that’s pinnable at the end of the fly section or at the upper mid section for an unobstructed ladder tip for rescue, and blue LED rung lights,” he points out. Hoherchak notes that the tractor carries the water tank ahead of the pump for better weight distribution, and that the pump is a front drive pedestal model to allow for proper drive line angles. “It’s a short tractor wheelbase even with the pump and tank,” he adds, “which allows for good maneuverability.” The tractor’s wheelbase is 180 inches, the trailer’s wheelbase is 343 inches, the TDA’s overall length is 59 feet 6 inches, and its overall height is 11 feet 5 inches. Taylor says that North Penn wanted more ground ladders than are typically carried on a TDA, and that KME accommodated them with their rig. “We have 356 feet of ground ladders, including three 35-foot, two-section extension ladders; three 28-foot, two-section extension ladders; several 20-foot straight ladders; several 16-foot roof ladders; a 10-foot roof ladder; a 10-foot attic ladder; a two-fly 10-foot Fresno (narrow extension ladder); and a 15-foot Little Giant ladder. He notes that a 35-foot extension and 20-foot straight are carried on the top of one side of the rig, while the other side has a 28-foot extension, and 16-foot roof ladder. The rest of the ground ladders are stored on beam in an internal rack fabricated by KME.